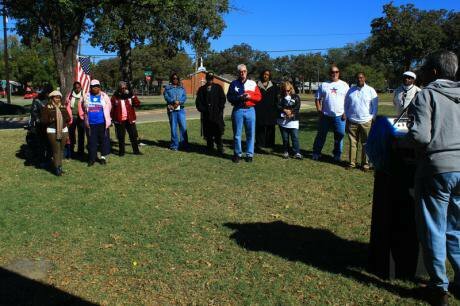 Fort Worth Texas Coalition of Black Democrats hold early vote rally, 2012. Richard Michael Knittle Sr./Demotix. All rights reserved. When Hong Kong students named their recent demonstrations for democratic elections “Occupy,” they reminded me not only of the Americans demonstrating for economic justice in 2012 but also of Beijing protesters who carried a “Goddess of Democracy” modeled on our Statue of Liberty across Tiananmen Square in 1989. Now that Texas and the conservative majority of the John Roberts Supreme Court are implementing a Voter I.D. law to disenfranchise hundreds of thousands of citizens who’ve voted legitimately in the past, Americans have an opportunity to return the Chinese demonstrators’ compliment: on November 4, they can turn Houston and other cities into Hong Kong by showing up peacefully and en masse at the polls. They certainly are, and we can reclaim them by emulating Hong Kong demonstrators’ brave, resilient efforts to re-join words to deeds by exercising legitimate democratic power. Unarmed African-Americans proved it in the 1960s, by bringing down what even Justice Clarence Thomas - who has supported both “Voter I.D.” laws and loose gun laws — called the “totalitarian” system of segregation in our southern states. They succeeded thanks partly to armed federal marshals and troops. But wholly unarmed peoples without national governments behind them have brought down imperialist, Communist, and autocratic regimes in British India, Soviet Eastern Europe, and many other countries. On November 4, long lines of unarmed Texas voters can salute American democracy’s counterparts and admirers abroad simply by showing up in huge numbers at the polls. This article is reprinted here with permission from its original publisher, The Washington Monthly.